I have been making my Mom's fudge recipe every year for Christmas since I was a teen. We always had it on Christmas. Eve. For awhile I was putting walnuts in it, but them I started making it for gifts for various people, so some people didn't like nuts. Now there are so many nut allergies, I just decorated a few pieces with walnuts. Lately I've been making it plain, but now Lindsey from Gingerbread Bagels blog is rubbing off on me. Now I feel compelled to try out different topping for the fudge, crushed candy canes, chopped up Snickers, walnuts and , M&M's. I'm pretty sure that I don't have the candy stash that Lindsey does. 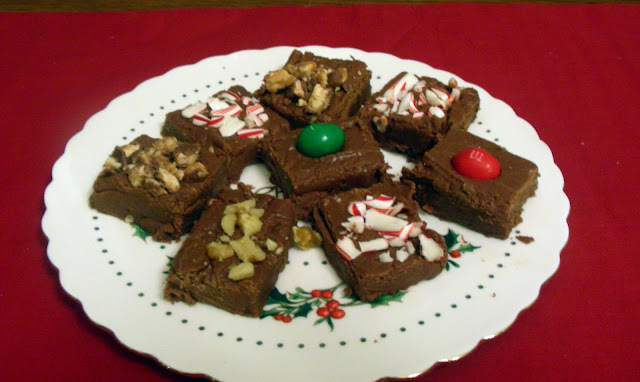 This fudge recipe is very versatile and you can vary the toppings, or you can vary the flavor extracts: rum or peppermint,, or even add peanut butter.. You can even add liqueurs, Kahlua, Bailey's Irish Cream, or Grand Marnier. You get the idea depending on the recipient.. This particular recipe makes five lbs, so it good for giving as gifts. I have no idea where my Mom got this recipe and I never asked her. So here's the recipe, which is very simple. Spray with cooking spray a 15X10X1 pan. Combine, sugar, butter, and evaporated milk in a dutch oven. , Bring to a FULL rolling boil, stirring over medium heat, stirring constantly. Boil for 5 min, or until mixture gets to 234 degrees on candy thermometer, stirring constantly. Remove from heat. Add chocolate and beat well. Add in marshmallow fluff and vanilla stir until well combined. Spread into prepared pan and cool. Cut in squares and Enjoy! Ron Santo, iconic radio broadcaster for the Chicago Cubs, passed away early today. My husband and I feel like we lost a member of our family. It is ironic that I'm blogging about this on my My Mom's Fudge post because my Mom was a devout Cub fan and loved Ronnie. That is somewhat amazing , a Cub fan who grew up near St. Louis in Cardinal country, was a Cub fan, much to to the chagrin to my Dad, who is a lifelong Cardinal fan. In my Mom mom's later years, we took her to some Cubs games and my Dad was very quiet during those games. Had it be known, I think she liked the Cubs, just to bug my Dad. They were married 65 years, however, so the Cub- Cardinal rivalry didn't really come between them.. 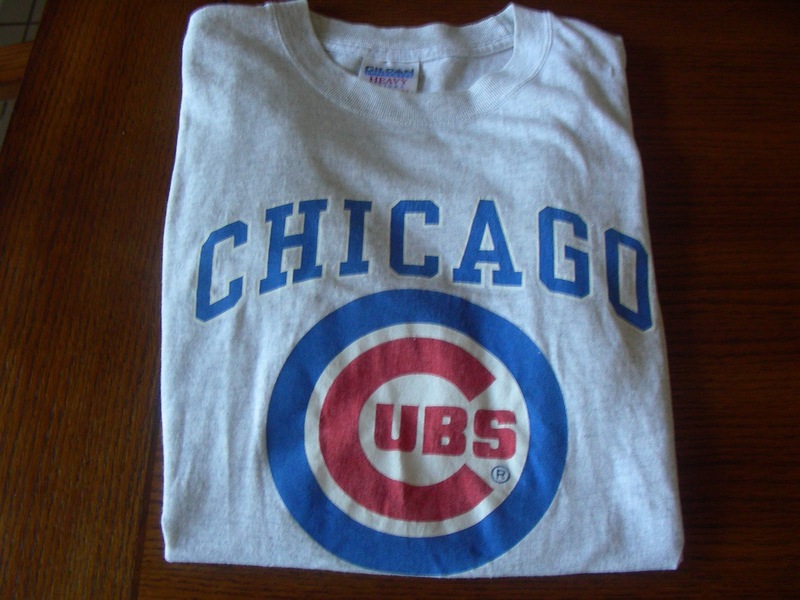 Here is my well worn Cub shirt, which I will wear today, in memory of Ron. Chicago, the Cubs, and his fans have lost an ambassador to baseball and JDRF, Juvenile Diabetes Research Foundation. He was the color commentator for the Cubs games for many years. Ron also sponsored walks and has raised millions for juvenile diabetes research He was one of the first athletes to compete the Diabetes, Type 1, and was very passionate about finding a cure. I could go on, but if you want more information or remembrance, turn on your radio or computer to WGN, 720 a.m.. RIP Ronnie. This sounds a lot like my Grandma's fudge recipe. The marshmellow creme and evaporated milk are ingredients she used also. I have several memories of her making this for us. Laura- It's like comfort food;) It wouldn't be Christmas without the fudge. Sandra- Thank you for your kind comments. I'm a Cubbie fan too and am sad that Ron is gone. I didn't realize that he did all that though. Double loss for us all. Lindsy tends to rub off on all of us, I think. Every time I hit her site and see that full-of-the-dickens smile, I can't help but smiling too. your fudge looks wonderful. I haven't bothered trying to make any because I'm not a chocolate person, but now that Dudette's old enough and has proclaimed her love for the stuff, I'll have to give it a go. Thanks for the recipe. What a great loss for the Chicago area, we feel your loss. We have had a few our sports broadcasting icons pass away recently, and its never the same listening to the game or the news. Your fudge does look delicious, and I keep hoping some of Lindseys talent rubs off on me! Chef Dennis- Thank you for your kind sentiments. Yesmin- than you for your comments. Looks beautiful and delicious! yum! My heart goes out to Ron's family...it sounds like he was an amazing fan. Your fudge looks delicious. I love recipes that have been in families for years. Thank you so much for sharing. Have a beautiful Sunday! Oh such lovely festive looking fudge!! your fudge looks amazing, love the M&M on top, yummy. Monet- I will be posting more family recipes later this month. Have a great week. Kimberly- the fudge is good. Have a great week. So sorry to hear of his passing! Love how you still make your mom's fudge, isn't making mom's recipes just like having her there beside you in the kitchen. I think my mom makes the same recipe! Can't wait to start my holiday baking. Have a great day! oh my this fudge looks so yummy! thanks for sharing this post. Grilled PorkTenderloin with Pomegranate Success!